The European Space Agency's Herschel space telescope, due to end its mission observing the infrared universe in March, may be sent on a crashing course toward the moon next summer to search for water embedded beneath the lunar surface, according to scientists. Suggested by an international team of more than 30 planetary scientists, the scenario is still working its way through ESA's advisory machinery before a final decision is taken by the end of the year by the agency's director of science. Herschel's $1.4 billion astronomy mission will end some time in March, when the observatory's cryogenic superfluid helium runs out. 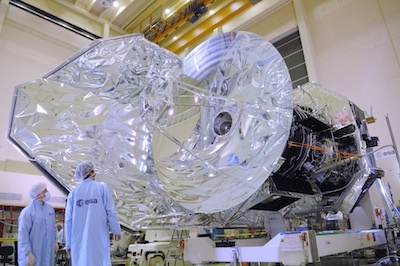 Herschel's three "world-class" imaging and spectroscopy instruments will almost instantly become useless as the last of the telescope's coolant drains out of an insulated dewar, according to Göran Pilbratt, Herschel's project scientist at ESA. Fitted with an 11.5-foot-diameter primary mirror, Herschel is the largest telescope ever flown in space. It measures nearly 25 feet long and 13 feet wide. Designed to peer inside star-forming regions, discover distant galaxies, study interstellar dust, and observe objects within the solar system, Herschel's detectors are cooled as low as 0.3 Kelvin, or minus 459 degrees Fahrenheit. When the telescope's helium supply is gone, Herschel's detectors will warm up and no longer be sensitized for collecting infrared light. Herschel launched in May 2009 with 2,300 liters, or more than 600 gallons, of liquid helium, but the fluid gradually boils off in space. "When the coolant is gone, then Herschel is useless as an astronomical facility," Pilbratt said. After a brief period of engineering tests, controllers will move Herschel away from its station at the L2 libration point, a location one million miles from Earth where the gravitational effects of the sun and Earth balance. Because Herschel's orbit at the L2 point is unstable, ESA wants to guide the craft on a known trajectory. "The spacecraft needs to be put somewhere for posterity," Pilbratt said. "You don't want it to come hitting our heads." Place Herschel into a solar orbit where it could not encounter Earth again for at least hundreds of years. Guide Herschel on a course toward the moon for a destructive high-speed collision to search for water. It would take about 100 days for Herschel to reach the moon, depending on which pole is targeted. 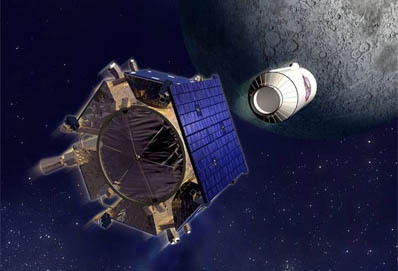 If approved, Herschel's moon mission would be a more explosive, and smartly targeted, encore to NASA's LCROSS lunar impactor, which struck a crater at the moon's south pole in 2009 and found water, according to Neil Bowles, a planetary scientist at Oxford University in the United Kingdom, who coordinates the research team proposing the use of Herschel for the water hunt. LCROSS launched in June 2009 with NASA's Lunar Reconnaissance Orbiter on a United Launch Alliance Atlas 5 rocket. The experiment consisted of a shepherding spacecraft and used the Atlas launcher's inert Centaur upper stage to smash into the moon at 6,000 mph, carving ice and rock from the floor of a permanently-shadowed crater. Sensors on the shepherding spacecraft detected water vapor in the debris cloud generated by the Centaur rocket's impact, proving the long-held hypothesis of ice cold-trapped inside polar craters which never see sunlight. In three years since the LCROSS mission, scientists have discovered signs of more widespread ice using temperature maps produced by the Diviner instrument on the Lunar Reconnaissance Orbiter. Instead of only lying at the bottoms of dark craters near the moon's poles, where temperatures fall to minus 400 degrees Fahrenheit, ice could reside just below the surface in regions which periodically see sunlight. "The sun shines only very occasionally during the lunar year in some areas around the pole, so there maybe regions of permafrost just below the surface in these places," Bowles said. Herschel could provide a ground truth confirming the model predictions and Diviner's observations from orbit, said Bowles, who also serves on the Diviner science team. If locations with occasional sunlight harbor ice and other volatile compounds, such as sulfur dioxide, carbon dioxide, formaldehyde, ammonia, and methanol, the materials could be more accessible to future explorers. Astronauts living on the moon could harvest ice for drinking water, breathing air and rocket fuel. "There is the possibility that there is stable ice buried a few centimeters to a few meters below the surface, and that's accessible from an impact of a spacecraft with the mass and orbital dynamics of something like Herschel," Bowles said in a phone interview. "You should expect to see some of that material ejected, and if you can get the right instrumentation on the ground or from orbit, you can actually detect it." 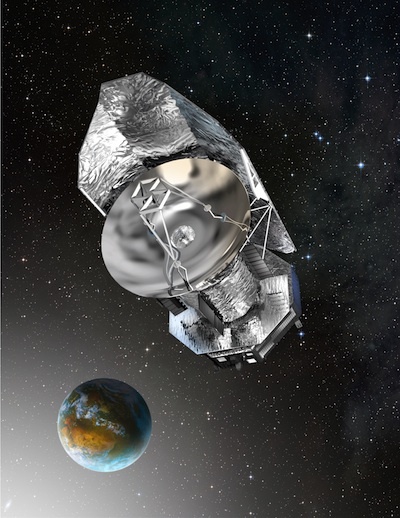 While LCROSS benefited from an up-close perspective with a shepherding spacecraft, a Herschel impact would be tailored for observations from Earth or space assets such as the Hubble Space Telescope and LRO. Spectrometers would try to measure the chemical constituents in the ejecta kicked up by Herschel and look for the signature of water. With its fuel tanks emptied, Herschel will have a mass of 2.8 metric tons, or about 6,172 pounds, slightly more than the Centaur stage used by LCROSS. Scientists expect the spacecraft would strike the moon at about 6,000 mph. "It's actually quite a different impactor [than LCROSS], but we would expect to excavate a similar-sized crater and have similar-sized ejecta," Bowles said. NASA projected the Centaur impact in 2009 would create a crater 92 feet wide and 16 feet deep. Bowles said he expects to hold a targeting workshop with the lunar science community in November to begin the process of selecting an aim point for a potential Herschel impact. "We have to keep moving forward hoping that it's going to happen until ESA tells us no or yes," Bowles said. "If it does happen, it's going to happen very quickly next year, so we have to get all of our observers in position." The earliest Herschel could be at the moon is about June or July of 2013. Officials say the cost to ESA of the lunar impact could be minimized by performing the spacecraft's closeout operations in parallel with the maneuvers toward the moon. "It is certainly lower than the cost of a purpose built mission with similar science goals," Bowles said. Some ESA officials are against the idea. "A lot of people find it interesting, but it's also true that some people really don't like the idea," Pilbratt said. "I think the people I know who have told me that they don't like the idea say it's more on emotional grounds," Pilbratt said. "They say that's not the way to finish off the spacecraft, or we shouldn't litter on the moon, things like that." It would not be the first time scientists have sacrificed a decommissioned space probe in their quest for lunar ice. At the end of its mission, NASA's Lunar Prospector orbiter was deliberately flown into a crater at the moon's south pole in 1999, but observers detected no evidence of water. Europe's SMART 1 lunar orbiter, China's Chang'e 1 spacecraft, and Japan's Kaguya probe made controlled impacts on the moon, but none were aimed at the lunar poles. "The lunar end seems somewhat traumatic, to say the least," said Paul Goldsmith, Herschel project scientist at NASA, a partner in the mission. "On the other hand, if the spacecraft is really no longer useful in doing astronomy... It would be a final scientific contribution, albeit not in the way you usually think of a mission ending."